Sound Normalizer améliore et restaure la qualité sonore des fichiers Mp3, Mp4, Ogg, FLAC, APE, AAC et Wav (PCM 8, 16, 24, 32 bits, DSP, GSM, IMA ADPCM, MS ADPCM, AC3, MP3, MP2, OGG, A-LAW, u-LAW). Cette amélioration de la qualité est atteinte par le contrôle et la normalisation du niveau du volume de ces fichiers. Le programme comprend également le traitement par lots pour le contrôle lot, lot par lot et la normalisation et le convertissage des fichiers Mp3, Mp4, Ogg, FLAC, APE et Wav (PCM 8, 16, 24, 32 bits, DSP, GSM, IMA ADPCM, MS ADPCM, AC3, MP3, MP2, OGG, A-LAW, u-LAW). Mp3 / Mp4 / Wav / FLAC / Ogg / APE / AAC Normalisateur peut exécuter le contrôle et la normalisation de chaque chaîne indépendante. 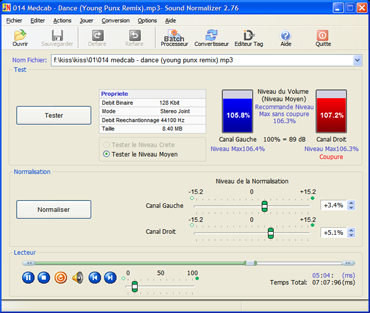 Sound Normalizer aussi permet de modifier les tags d’ID3, FLAC, Ogg, MP4 convertir des fichiers de FLAC en Mp3, FLAC en Wav, Wav en Mp3, Mp3 en Wav, Mp3 en Mp3, Wav en MP4, Wav en AAC, MP4 en Wav, MP4/AAC en MP4/AAC, AAC en Wav, Wav en APE, APE en Wav, APE en Ogg, Wav en Ogg, Ogg en Mp3, Ogg en Wav en utilisant l’encodeur Lame MP3 Encoder 3.99.2, FLAC Encoder 1.3.0, Monkey’s Audio Encoder 4.11, Ogg Vorbis Encoder 1.3.2 (aoTuV 6.03), FAAC Encoder 1.28, écouter des fichiers Mp3, Mp4, FLAC, Ogg, APE, AAC et Wav en utilisant le lecteur intégré. Added error processing for Mp4, FLAC, APE, AAC and Wav files. Improved support of Mp3 files. Added support of ID3 Tags ("User Text", "Encoder by", "Modifed by", "Orig Artist", "Orig Album", "Orig Filename", "Orig Lyricist", "Orig Year", "Lyricist", "SubTitle", "Content Group", "Key", "BPM", "Publisher", "Copyright", "User URL", "ISRC", "Play Count", "Album Artist", "Disc", "Conductor"). Added support of Ogg Tags ("METADATA_BLOCK_PICTURE", "COVERART", "COVERARTMIME") for Ogg files. Improved support UNICODE for MP4 and FLAC tags. Improved support of the Windows 10. Added new quick ID3 tag scanner. Added support of RIFF INFO tags for WAV files. Added converting MP4/AAC to MP4/AAC (mp4, m4a, m4b, aac) files. Added converting APE to MP4/AAC (mp4, m4a, m4b, aac) files. Added converting FLAC to MP4/AAC (mp4, m4a, m4b, aac) files. Added support of ID3 tags for format AAC (aac). Added converting APE to Ogg files. Improved support of format Mp3. Added support of format APE (Monkey’s Audio). Improved support of format FLAC. Added support of playlists M3U, M3U8. Added converting FLAC to Ogg files. Added support of format Ogg Vorbis. Improved converting for formats Mp3, FLAC. Added new method of normalisation "Normalize each file on a maximum level without clipping" for Wav and FLAC files. Added new method of normalisation "Save a ratio between channels". Added representation in decibels (Db) for Wav and FLAC files. Added support of Unicode for FLAC tags. Added representation in decibels (Db). Added FLAC tags Editor. Fixed bugs. Added support of FLAC tags. Fixed bugs. Updated coder Lame to Version 3.99.2. Added support of Unicode for ID3 tags. Fixed bugs and improve interface. Improved player for the Batch Processor. Fixed bugs. Added player for the Batch Processor. Improved converting for Mp3, FLAC and Wav files. Support of Wav files is improved. Fixed bugs and improve interface. Added convertor FLAC to Wav (PCM 8, 16, 24, 32 bits, DSP, GSM, IMA ADPCM, MS ADPCM, AC3, MP3, MP2, OGG, A-LAW, u-LAW) files. Added smooth fade in and out for player. Support Mp3 files is improved. Support Mp3 files is improved. Added converting FLAC to Mp3 files. Added converting Wav (PCM 8, 16, 24, 32 bits, DSP, GSM, IMA ADPCM, MS ADPCM, AC3, MP3, MP2, OGG, A-LAW, u-LAW) to FLAC files. Added support of format FLAC. Fixed bugs and improve interface.